From: San Francisco SPCA, San Francisco, Calif.
Amandeep, who blogs at 'Deep Trouble, sent this story of his new puppy Baozi (which means "little stuffed bun" in Mandarin) and shared her tale on his own blog, too. As soon as I moved out on my own, I thought about getting a dog, but with adulthood came a dawning realization of how much work that would entail. I knew I wasn't quite ready. But still the idea persisted. Every friend's dog that I baby-sat tested my resolve. Every girlfriend I had was measured up as a potential puppy-mamma. Every "sidewalk-adopt-a-pet" event I passed on the street was a crisis. Eventually, I realized that having a dog was doable, but given the unusually active life I lead, it would be hard to get a puppy and give it the time it needed. I began strategizing. Perhaps an older dog would be the best choice for me given my lifestyle and my various time commitments. Maybe I could pay for a dog-walking service? Eventually, I decided that I should wait till I lived with a girlfriend to truly give this a go, just to have somebody to split the responsibility with. Early on in my relationship with Kimberly, my current girlfriend, we discussed our mutual love for dogs, and agreed that if we were to ever get a dog, it would be from the pound or from one of the many rescues we know of. There are simply so many dogs that need good homes and so many health issues with purebreds, that we knew we wanted to get a mutt. In this vein, I also tried to convince her that we should get an older dog, since they might have a harder time getting adopted. She was sympathetic, but was dead set on the "puppy experience." As our relationship deepened, we kept coming back to the dog idea, but mostly to tease the other person by playing puppy brinksmanship: One of us would dare the other to go with them to the SPCA that very day, implying that the other person was the sole impediment to doggy-happiness. The other person would inevitably be stuck, reluctantly having to play the role of "responsible adult," since they were the only defense against making a change we actually weren't ready for. Finally, earlier this year, we decided to get married (! ), and in talking about eventually having kids, the subject of a dog came up as well. Kimberly signed us up for "Puppy Owner Orientation" at the SPCA, and a few weeks back, we went. The class was thoughtful and informative and we left sobered at the sense of how much of a change a puppy would be, and how much responsibility and complication it would add to our lives. We really treasure the way our lives work now and wondered if we should gamble with our happiness. We talked about it and let the idea sit on the back burner. 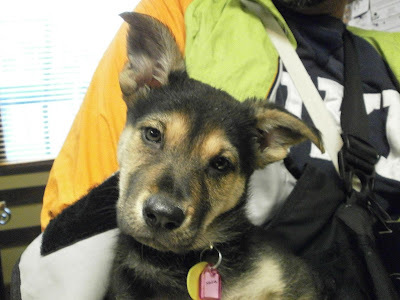 Then three weeks ago, Kimberly got one of the periodical "new dogs" emails from the SPCA and saw a series of little German shepherd mix puppies that were adorable. She forwarded me the email with many exclamation points. 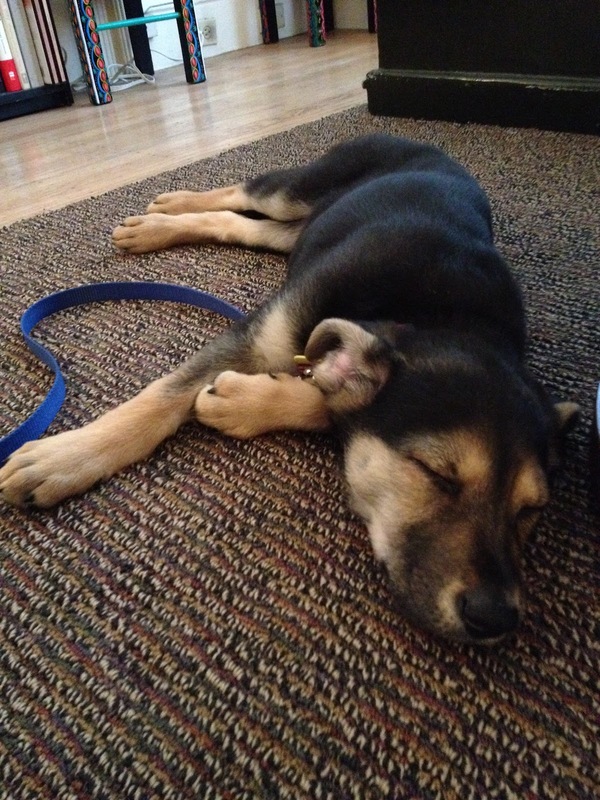 I took one look at the puppy pictures and knew we were at the precipice. That night, I spent a lot of time thinking about my life and the directions things were heading and whether I was truly ready to be the parent of a puppy. I realized that I could be, but that it would entail a lot of change. I also realized that I had a great partner to take this step with and if I didn't do it soon, how could I possibly be prepared to have kids in the near future either. In the end, I realized that now was the time. The next day, we went to the SPCA and played with one of the little puppies from the litter we liked so much, and visited with its mom (who was also at the pound). 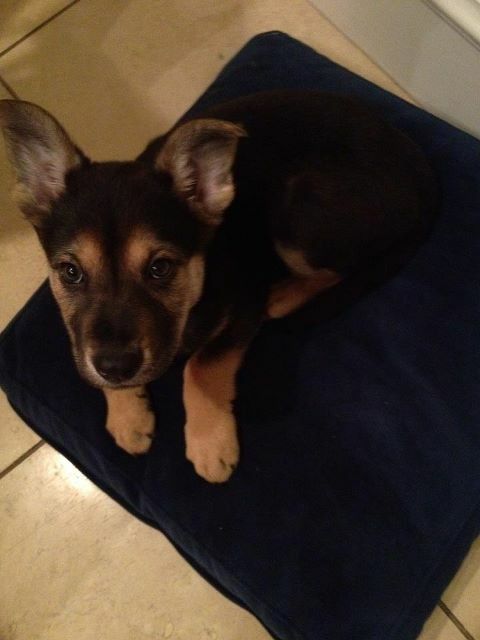 *** We quickly fell for the little dog we were playing with: she seemed playful, sweet, inquisitive, and mild-tempered. We talked about adopting for a few minutes and decided to do it. We reserved the little pup so we could go home and prepare. The next day, while I was away at an event, Kimberly formally adopted her and brought her home. We've had our little girl for two and a half weeks now, and it has been fantastic. I took the first two weeks off from work to get her acclimated, and that was a lifesaver. The first few days were quite the adjustment, and I learned a lot about myself and my cute little dog. Kimberly and I have been a great team and have learned a lot about how to work with each other, and what each of us wants out of a dog. The dog is a joy and worth every second of it, even when she is being frustrating (not wanting to pee/poop because it is raining!). We named her "Baozi," pronounced "Bow-dse," which means "little stuffed bun" in Mandarin. She's sweet and fun, and is learning the ropes fast. She's getting really good with house training (very few accidents! 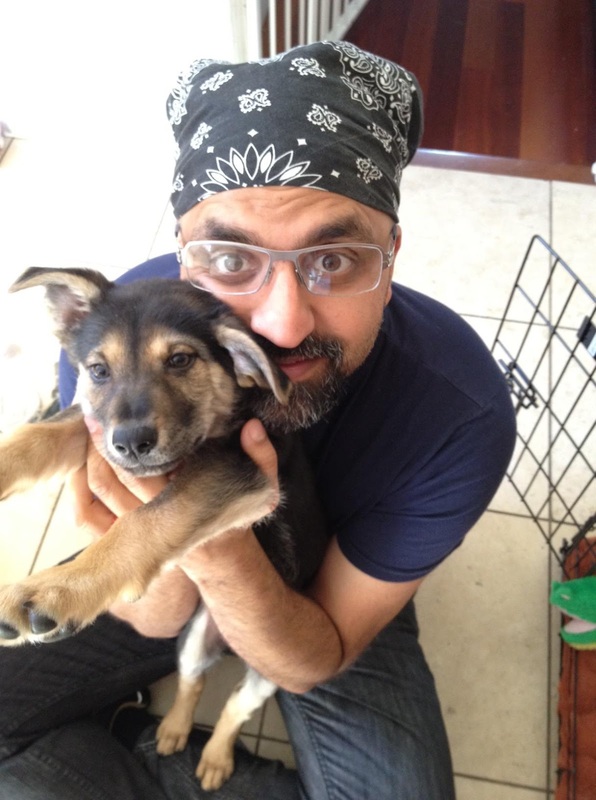 ), and we're very happy with crate training. This week I'm back at work, and so we're adjusting her to being at home in her crate for long stretches. I've set up a little webcam to watch her while we're at work to see how it is going and, so far so good! Everyday, we each rush home to play with little Baozi and compare notes on how she's doing. She's so much fun to have around and is so adorable we can barely stand it. She doesn't have all her shots yet, so her time outside is carefully limited and monitored. We (and she!) can't wait to get her out into the world for walks and meeting other dogs. We are just starting full-on training and commands and are looking forward to that as well. We are at the beginning of this adventure, but are just so happy we made the leap. It is certainly true that our lives are already different, but none of it has been bad so far. We are already figuring out how to fit our schedule with hers, and hers with ours. We are learning a new life as we go and it's great. A dream come true? Why yes, yes it is. * I think it is was because I've always loved animals, and mammals in particular can really connect with you. And nothing says connection, more than a dog! ** Ironically, many years later, long after I left the house, my mom ended up taking care of my brother's dog for a while, fell in love with it, and adopted it in the end. *** There were four sisters in the litter and they were already popular: one was adopted as we walked in the door, and the other two were adopted soon after we adopted ours. The mom was adopted as well!